It’s no secret that having a full-scale mobile strategy to meet the expectations of today’s mobile-savvy consumers has become a must for companies. Increasingly, the answer to making the strategy a reality is to partner with a mobile engagement expert. In today’s world of ever-changing technologies and regulations, partnering has become critical to maximize results and minimize project risk. But what’s the best way to go about finding this partner? Just for starters, consider some of these topics: What are my needs, what audiences do I want to reach, what mobile tools should I think about, and what technologies should I use? 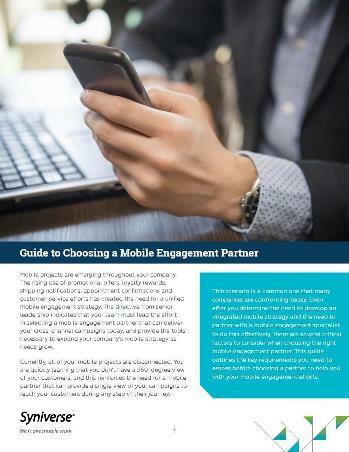 To help navigate the process and add some structure to the review, we’ve created a new resource, “Guide to Choosing a Mobile Engagement Partner.” In it, we outline the key requirements that you should consider when choosing a partner for your mobile engagement efforts. Among the topics included in the guide is a checklist of critical goals and the common challenges associated with them , and a list of seven capabilities that should be evaluated before making a decision. I invite you to download the guide, and I hope it helps you in finding the perfect partner to make your mobile engagement vision a reality. Please let me know about your challenges in this area, and your priorities in choosing a mobile engagement partner.